With its regimented road system, eagle-eyed traffic police and careful motorists, Singapore doesn't see much in the way of daredevil driving. 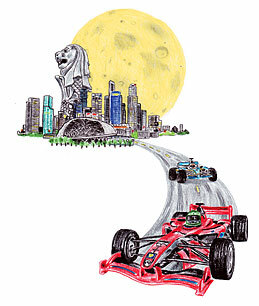 But all that will change between Sept. 26 and 28 when the Lion City hosts its first Formula One Grand Prix race. The highly anticipated event is the only Formula One race in Asia to be held on a street circuit, and the only one in the world to be held at night. Drivers  including top stars like Lewis Hamilton, Felipe Massa, Kimi Räikkönen and Nick Heidfeld  are expected to reach speeds of more than 185 m.p.h. (300 km/h) along a roughly three-mile (5 km) circuit in the city's Marina Bay area. (The three-quarter-mile [1.2 km] starting and finishing stretch has been constructed from scratch while other parts of the course, like curbs and traffic islands, have been modified to bring them up to standard.) The course direction is anticlockwise  a quirk matched at Formula One events only by Turkey and Brazil  and drivers will need to expertly negotiate a total of 23 corners. Fast corners (those where the turn is sweeping, so as to allow the cars to carry more speed) have been selected wherever possible. These, plus very long straights, mean that spectators could well see some new records set for Formula One street racing. Three-day grandstand tickets for the Singapore Grand Prix aren't cheap  those still available are mostly in categories that range from about $347 to a rather pricey $1,800  but you do get plenty of vroom for your buck. As well as the main event, you can catch the Aston Martin Asia Cup (featuring the ferocious Vantage N24 GT cars), the two-event Formula BMW Pacific race (a keenly watched entry-level competition in Formula racing) and the Porsche Carrera Asia Cup (the ninth fixture in an 11-race, four-country competition). Finals take place on Sept. 28, with practice sessions and qualifying heats on preceding days. Passes can be bought via the ticketing hotline, (65) 6738 6738. For more information, visit www.singaporegp.sg.